Newpoint 911 Series: Terri Blackstock has written some awesome books in the Christian suspense genre', but this seris is by far the best, in my opinion. 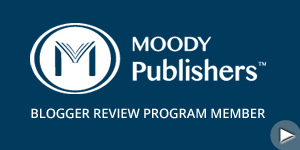 Great writing, plots, and characters. It was originally four books, but after the events of September 11, 2001, she wrote the fifth one. Interweaving suspense, romance and the role of redemption in human relationships, the Newpointe 911 series is Terri's salute to firefighters, paramedics and police officers--"who put our lives before their own." Suncoast Chronicles Series: Also by Terri Blackstock, this was her first series on the Christian market. The first book, Evidence of Mercy was totally awesome, and one of the first, if not the first, Christian adult suspense/mystery novel, and got me hooked on that genre' for life. Book description:After years of bitterness and anger over her ex-husband’s betrayal, Claire Conway’s life finally seems to be on track. She has raised a fine son, Dakota. Her work is going well, and for the first time in years she finds herself attracted to a man once again! Then Dakota brings home his fiancée, Sara Jennings, and everything falls apart. For Sara turns out to be the same woman Claire’s husband had an affair with twelve years before. Forgiving Sara seems impossible. Yet only in that hour of forgiveness can the three of them be truly set free. 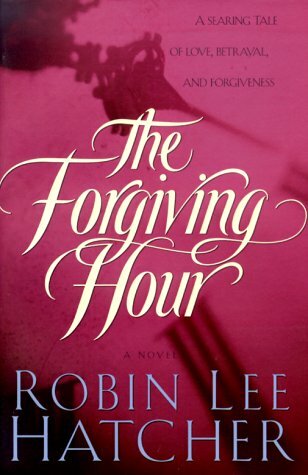 Filled with real-life issues like bitterness and self-protection interwoven with a beautifully written story of one woman’s search for peace, The Forging Hour dramatically illustrates the power of supernatural healing and how transforms lives when we allow God to work in our hearts. 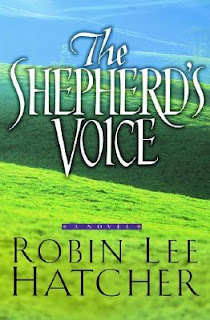 The Shepherd's Voice: also by Robin Lee Hatcher. Totally different story from the previous, but it also deals with forgiveness and other themes. For ten years, Gabe Talmadge languished in prison, convicted of a horrible crime. Now, he is free once again but unable to find work in the midst of the Great Depression. In desperation, Gabe returns to Ransom, Idaho, hoping that his uncaring father will give him food and shelter, if not love. But the prodigal son is not welcomed home. Hudson Talmadge, who virtually owns the town of Ransom, despises his youngest son as much as ever-and Gabe is as powerless to win his father's approval as when he was a child. 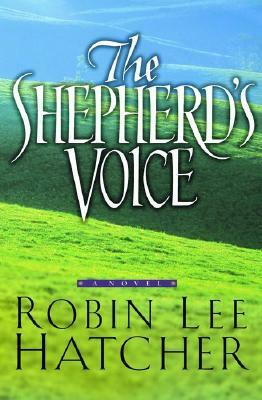 Hungry and hopeless, Gabe is rescued by the owner of a sheep ranch south of Ransom. Incredibly, Akira Macauley gives him a place to live and work to do. More than that, she gives him hope that he can receive forgiveness for his past-and perhaps even love. But just as Gabe comes to believe that happiness may be within his grasp, tragedy strikes Ransom once more. As his life begins to unravel, Gabe must either sink again into an abyss of hopelessness or cling to a hope, faith, and love stronger than any he has ever known. 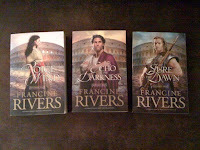 Mark of the Lion Series by Francine Rivers. 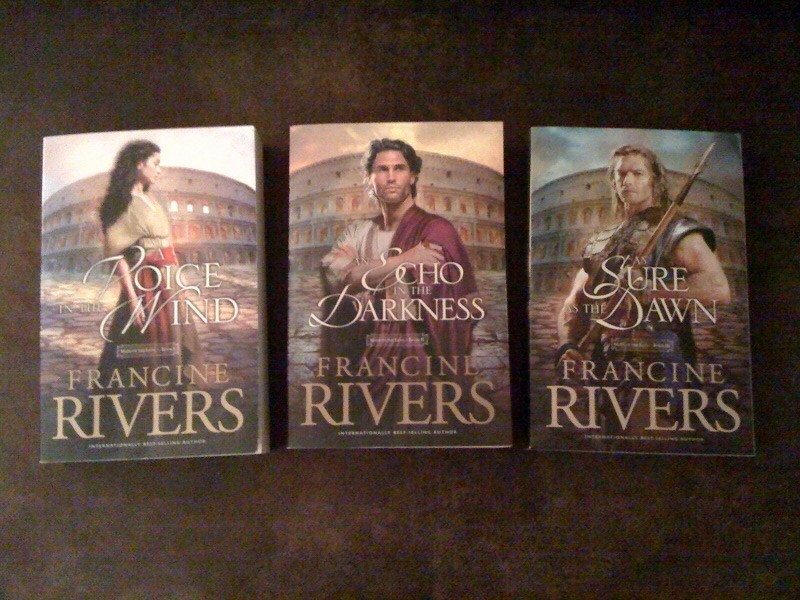 This series was my introduction to Francine Rivers, and her first foray into Christian fiction. It was a terrific series, especially the first two (the third didn't have a lot to do with the other two). I wish I had waited until book two was out to read book one, as it ends with a major cliffhanger. Travel back to the crumbling Roman Empire and meet Haddassah, a young slave girl; Marcus, a handsome aristocrat; Atretes, a brave gladiator; and Rizpah, a beautiful young widow. The gospel of Christ is the only weapon they have to battle the immorality that surrounds them---will they be wise enough to use it? The Atonement Child by Francine Rivers. This book really impressed me, and still does. It has a great pro-life message that many Christians may not even agree with, but it is a great story with a great message. The pictured book was the first edition, which I have. Redeeming Love by Francine Rivers. 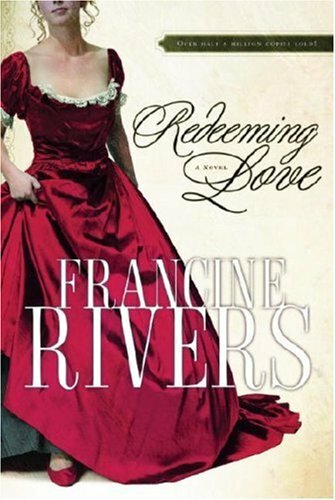 To contradict my earlier statement, this book was actually Francine Rivers' first book classified as Christian. It was published under a secular publisher and was pretty graphic. After she had a few other books published on the Christian market, she cleaned this one up and had it published on the Christian market. Some have still criticized it as a bit too graphic, but it is a great story. A retelling of the story of Hosea and Gomer from the Bible. If you enjoy Christian fiction and haven't read any of these books, then you should. I mean none of these authors disrespect, but it seems their best works are in the past. They may still be writing good books, but they are different from what they used to write. But then, these books mentioned here are top-notch and hard to follow. I especially like the older books of Terri Blackstock. Who says the newest books are the best? I don't.